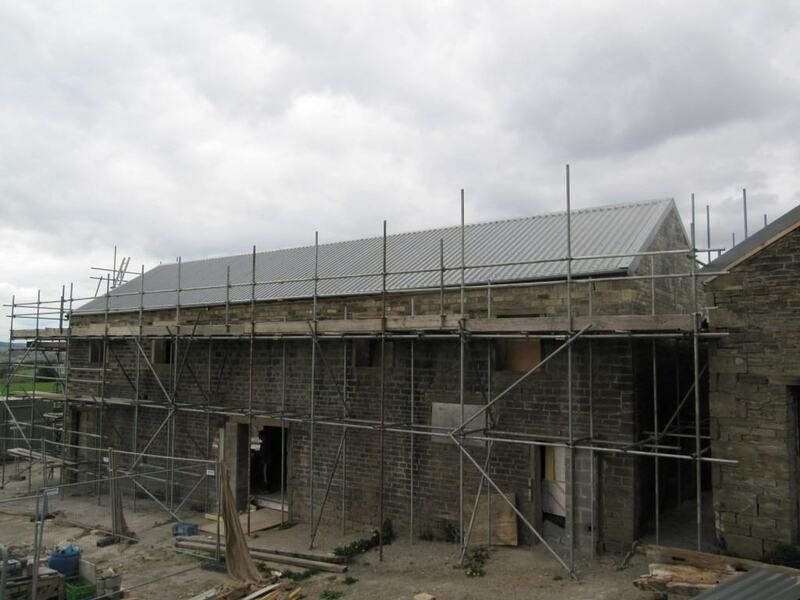 We have now fully completed the roof of the Cre8 barn at Stirley Community Farm. We are using Spano board on walls and OSB board in roof, which has been taped internally using Tescon No. 1. We’ve also draped the Pro Clima DA-S membrane around the purlins and trusses as we’re not going to be able to use airtightness tapes on the OSB boards around the purlins themselves. DA-S is an airtightness membrane which is very robust. The DA-S membrane is, in turn, be taped to the OSB board. (Otherwise the area around the purlins and trusses might have been an airtightness weakspot). 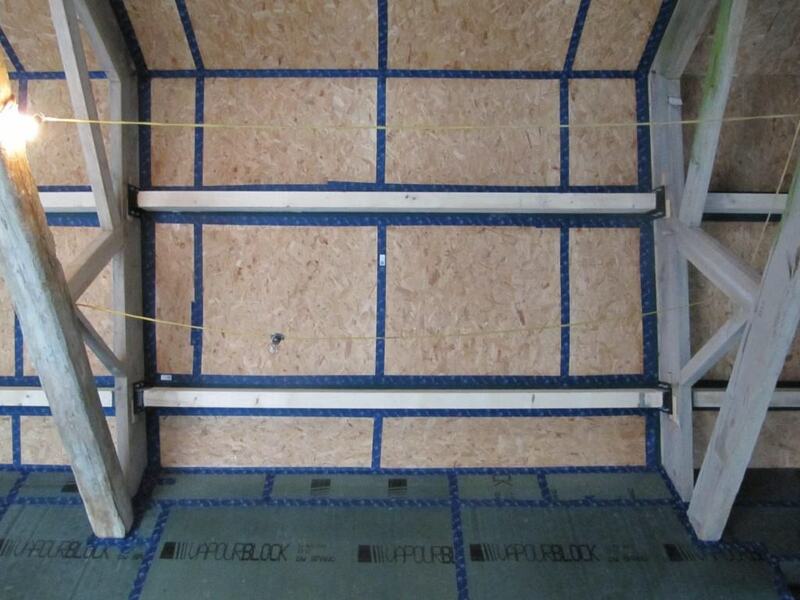 The OSB board in the roof is lined up with the Spano VapourBlock board on the timber frame wall – and taped together to form a continuous airtightness barrier. (We’ve also used DA-S at the floor wall junction with the membrane Orconed to the concrete and taped to timber frame). We are using 406mm deep TJ joists on top of the OSB board. We have added a thin 25mm layer of polystyrene and then 2 layers of 200mm fibreglass insulation on top. We have then laid 60mm Gutex Ultratherm on top – which we are using as the sarking board (the Ultratherm is more resiliant to moisture than the Gutex Multitherm which is what we’re using on the timber frame walls.) Then finally, we’re going for industrial corrugated steel roofing on top. We have fixed 25 X 50mm timber counter battens through the Gutex into the TJ joist rafters. 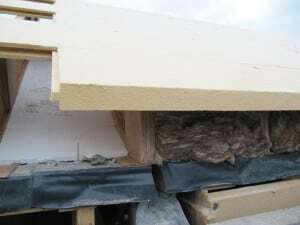 Insulation measures in the roof: polystyrene, fibreglass insulation and Gutex sarking board. The reason that we’re using a the thin layer of polystyrene in addition to the fibreglass insulation is that the depth of the rafters is 406mm We need to make sure that we minimise any potential thermal bypass. We couldn’t get the fibreglass insulation to the exact depth of the rafters and what we really needed is something slightly bigger so that the insulation will compress a little – so that that won’t be any air movement around the insulation. We’ve laid 25mm of polystyrene on top of the OSB board, which then gives us a space of 380mm on which to put 2 X 200mm fibreglass quilts. The Gutex Ultratherm acts as a sarking board – it is waterproof and will shed any water that might get underneath the industrial metal roof, (which it shouldn’t do). It is vapour open and it is also a windtightness barrier. Windtightness barriers need to be vapour open to allow any moisture that has got into the structure to be able to dissipate to the outside. It is very important that you have an airtight layer inside (in this case OSB board) and then a vapour open wind tight membrane on the outside, offering extra insurance against moisture ingression. However, because Passive houses are so airtight there is far less danger of moist warm air within the building getting within the structure. The Gutex Ultratherm is attached to the TJ joist rafters with screws. There will be a thermal bridge in the roof because of the TJ joist but it is minimised because of the shape of the TJ joist – it is thinner in the middle (the web) – so forms a smaller path for thermal bridging. The Gutex minimises it even more, reducing the path of the thermal bridging. It is the windtightness layer -to help minimise thermal bypass around the insulation, it has tongue and groove on all four edges. It is an insulator in its own right so it cuts down on the thermal bridge of the TJ joists. Vapour check and airtight sealing strip manufactured from PP, with a robust Polypropylene Protection Fleece, from Pro Clima.